Dr. Wendy Smith, head of medical physics at Calgary’s Tom Baker Cancer ­Centre. Photograph by Don Molyneux. Dr. Wendy Smith loves her job. 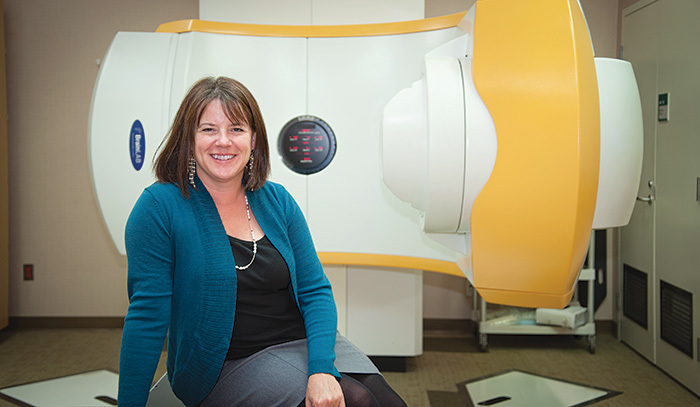 The head of medical physics at Calgary’s Tom Baker Cancer ­Centre, Smith uses her scientific inclination to improve outcomes of cancer patients through both research and clinical work. One of about 300 clinical medical physicists in Canada, Smith is an active researcher whose interest lies in the effect of motion on radiation therapy in the treatment of liver, lung and breast cancer. She is also keenly interested in the impact of timing inaccuracy in imaging systems. Smith, who is an associate professor at the University of Calgary, has published dozens of papers and given multiple presentations in her areas of research and has received funding for her work on using ultrasound to help guide radiosurgery of liver metastases. But her interest hasn’t always been focused on medical physics. She earned her first two degrees in physics at the University of Waterloo before developing an interest in medical biophysics, in which she earned her PhD at the University of ­Western Ontario in 2002. “When I started at university I wanted to do something intellectually stimulating,” says Smith, noting she studied black holes and wormholes while earning her master’s degree. “I enjoyed theoretical astrophysics – pushing the bounds of knowledge, but the idea of spending my life helping people and making their lives better, that was really intriguing to me,” says Dr. Wendy Smith. It was shortly after earning her degree in astrophysics that she developed an interest in medical biophysics. “I enjoyed theoretical astrophysics – pushing the bounds of knowledge, but the idea of spending my life helping people and making their lives better, that was really intriguing to me,” says Smith. While completing her doctoral studies, she was part of a team working to develop three-dimensional ultrasounds when the technology was still in its infancy. In fact, she treasures an image taken of her eldest son taken while still in utero. After finishing her studies and completing a two-year residency at the London Regional Cancer Program, a world-class cancer treatment facility in southwestern Ontario, Smith took a job at the Tom Baker Cancer Centre. She hasn’t looked back. “I never wanted to leave,” says Smith of her 12-year tenure at the Tom Baker Cancer Centre. “It’s one of those rare places you can have a job that is both clinical and academic.” In fact, Smith says she has been able to apply most of her research to real-life scenarios, giving her the insight she needs to truly improve the outcome for cancer patients. Medical physicists at the Tom Baker Cancer Centre are responsible for ensuring the radiotherapy treatments prescribed by physicians get administered properly, explains Smith. They do this by making sure all the complicated imaging and radiology equipment is running properly, a very important job when mere millimetres can make a difference. A typical day might see Smith confirming that tiny radioactive seed implants are placed in precisely the correct position – using highly technical ultrasound equipment – during a prostate brachytherapy implant, working to help treat a tumour with stereotactic radio surgery or calculating the dose and time needed to treat cancer with a linear accelerator. 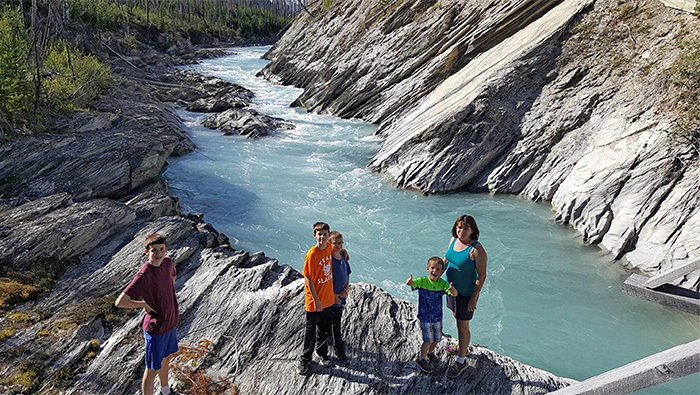 Dr. Wendy Smith enjoys some active time with her four sons. Photograph by Don Molyneux. 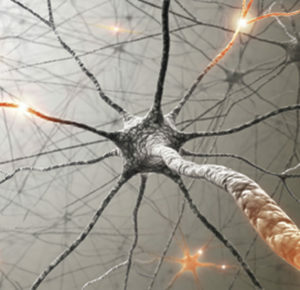 “We design treatment techniques and develop processes with radiation therapists and oncologists. 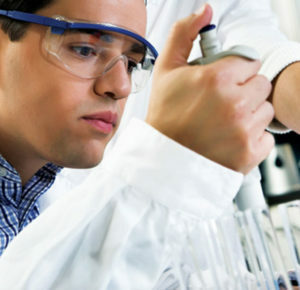 Medical physicists mainly do behind-the-scenes work,” says Smith, noting another key role for the highly educated professionals is to solve problems on the fly, often in intense situations. Aside from her clinical work, Smith is keenly interested in improving the quality of delivering radiation therapy. That topic is, in fact, where her research interests now lie. For instance, this work involves using infrared markers to ensure radiation treatment occurs in precisely the same location in breast cancer patients for every dose, thereby keeping the tissue near tumours as intact as possible. “We can carve that dose to be within less than two millimetres,” says Smith, noting ensuring cells near tumours stay healthy is not only cosmetically, but often medically, important. A uniform dose is also critical, and can be affected by something as small as the patient’s normal breathing patterns – especially when treating breast or other cancer close to the lungs. Smith says her team’s research in that area has led to changes at the clinical level. “Now our standard of care is having breast cancer patients take a deep breath to move the heart out of the field,” she says. Smith doesn’t work alone. She and the other 10 medical physicists at the Tom Baker Cancer Centre work with oncology and radiology physicians, students and radiation therapists. But most of all, she hopes for better outcomes for her patients. “A good-quality treatment should result in a better quality of life [for patients],” she says. The Tom Baker Cancer Centre, which Smith says treats about 3,600 cancer patients with radiation annually, has several specialty treatments not available anywhere else in the province, including stereotactic radiosurgery, breast brachytherapy and total body irradiation for bone marrow transplant preparation. In fact, Smith says her team recently implemented a novel arc delivery for total body irradiation that decreases treatment time, reduces staff injury and improves patient experience, with the first patient being treated with the method in January. Although it’s not the standard of care yet, Smith is hopeful it can be used to improve the experience of many more patients in the future. As for the future of cancer treatment, she says recently there have been “tremendous improvements” in the area of integrated imaging to verify locations of tumours in patients. “That’s really exciting,” she says. She is also thrilled with the new cancer treatment centre to be built at the Foothills Hospital site. The centre, for which the province has budgeted an estimated $830 million and has indicated will be completed in 2024, will help ease overcrowding at the Tom Baker Cancer ­Centre and ­offer a full slate of cancer treatments. She expects the new centre will help recruit world-class researchers and clinicians to southern Alberta and spur even more research. “Success breeds success,” she says. What is something surprising about you? I am married to my high school sweetheart and we have four sons, ages six to 15. What do you do in your downtime? In my downtime, I mostly spend time with my family. We built a patio over the past few weeks, and the kids were right in there digging holes, carrying gravel and laying bricks. Do you have any hobbies? Recently, I have taken up cycling and have started biking from the park and ride to work. I also cycle on the weekends. Since I started in February, I have put on 1,250 kilometres. I also like to garden, colour and play video games with my husband and sons, but I’m not particularly good at any of those things. Where did you grow up? All over the United States and Europe. I lived in 10 different places before I graduated from high school! A typical Sunday morning looks like ... Either we go to church or have a family activity. Last weekend, for example, we went on a six-mile bike ride and assembled patio furniture. What was the last film you saw? Grosse Point Blank. We are working our way through ’80s classics with our teenager and preteen. The last film I saw in the movie theatre was The Secret Life of Pets. What was the last book you read? I’m currently reading Without Fail, which is a Jack Reacher novel by Lee Child. Prior to that, I was re-reading a Terry Pratchett novel, Interesting Times. He’s definitely my favourite author. How do you balance work and home life? When I am at work, I’m entirely at work and totally focused on it and when I’m at home I tend to turn things off and be very present and there with my family. Also, my husband and I share the household duties.